For our Beginning Ruby on Rails training course in Boston, January 29-30, all attendees will be: DEVELOPING ON HEROKU. Have you ever tried to teach Rails to a friend? You want them to feel web development with Rails. Your student may have never used the command line. Your student may be on Windows, Mac, Ubuntu, or another operating system. Your student may not have SQLite, MySQL, Ruby, Rubygems, or Rails installed correctly. Your student may have never used a text editor such as Vim, Emacs, Textmate, or gedit. I believe Heroku elegantly solves these problems. Get your friends excited about Rails development without boring or confusing them with ancillary information. Matt Knox of Sermo has been teaching Rails to other members of Boston.rb using Heroku. This is really a great idea so we’re stealing it. 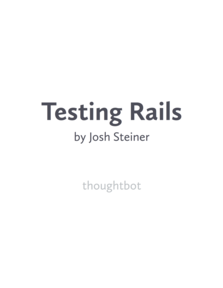 Your Rails app is immediately up and running on Heroku, which runs on top of Amazon Web Services. It displays the default Rails public page with modified instructions. Now import it into Heroku using the form. After importing, you’ll see your app’s view again. You can see Suspenders is now installed, giving us access to the latest Shoulda, Factory Girl, rake tasks, Hoptoad Notifier, and much, much more. That’s it! We’ve got Heroku wearing Suspenders, an excellent, standardized environment to teach Rails wherein students can learn the important stuff first, such as actual Test Driven Development with Rails, instead of fiddling with their OS, gems, or text editor.